Koji is more than just a musician. Music is just one of the tools that he uses to express his feelings on issues that he feels passionate for. For example, he used the preorder for his brand new record Crooked In My Mind as a way to donate to several organizations that fight issues that he finds important to the world as a whole. Koji graciously took some time out his busy touring schedule with Turnover, Have Mercy, and Ivy League to talk to us in Baltimore, Maryland about topics such as touring for long periods of time, the second edition of the Warped Tour Acoustic Basement, the record preorder, playing the Idobi Meltdown Festival, and far more that you can read below. My name is Koji, I’m from Harrisburg, Pennsylvania and I reside in Philadelphia. You're nearing the end of a long coheadlining tour with Turnover, Have Mercy, and Ivy League. How's it been so far? It’s been crazy. It’s been a dynamic experience. I think every trip, whether I’m travelling for music or just travelling for experience is dynamic and I think the spectrum of experience has been everything from great culture, food and coffee and art experiences and wonderful natural settings, going out to seeing beautiful spaces between the shows we play, but I think so much of how you’re living on tour is so dependent on how you spend your time not playing. I would also say that the conversation and the dialog of this tour that I’ve been having with locals, whether their fans or promoters or bands that played or just strangers you meet on the street, I think it’s been very cool and it adds more context to the songs that we’re performing, for us as the Koji band. I felt very connected to the places we go and that’s probably the biggest place, just the connection to the people and the line. If I could choose just one word, it would be inspiring. I know you're used to being on the road for such a long time, but is it still tough to make it through a 40 date tour with very few off days in between? It’s hard when you have things going on at home, especially when you don’t have days off and you’re pummeling your way through the west where the drives are longer. But I would say for all the fatigue and at times emotional distress of testing your physical and mental limits, I would say my team, and by my team I mean my band, my rhythm section, they’re my rock. And similarly, the guys on this tour in Ivy League and Have Mercy and Turnover, they’re a wonderful support system. But you know, we just get through. But again, if it wasn’t for them and the wonderful people that I get to talk to every night, I don’t think I’d have interest in doing it. The bond you share with people while you’re travelling and the people you meet on the road, those interactions are life giving. So I feel fortified and I have everything I need to make it through. On one of those off days of tour you stretched yourself out even more and played a day on the Warped Acoustic Basement. I know you played the tour last year there, but how was it this year compared to its debut year last year? It’s very cool. There’s a lot of highlight artists. Of course, Brian Marquis, the mastermind behind it is there again this year, and he’s just such a wonderful human being and a wonderful artist. He curated a really cool stage this year and I think that the highlights for me this year are artists like Allison Weiss, she’s my number one this year. The American Scene is really cool. Vinnie Caruana is on it again this year. And there’s just a lot of cool guests that have been a part of it. I would say it’s a very different tour this year. Maybe because I’m not on, but because last year was such a special year for all the friends and the people of our portion of the scene that were on it. It’s a different environment but that doesn’t mean friends aren’t there. I got to hang out with Man Overboard and The Wonder Years, the NeverShoutNever dudes. A fairly diverse group of people geographically and sonically. It was cool. Very cool. You released Crooked In My Mind not too long ago. How do you feel the reception has been to it so far? It’s been deep. It’s not a record I wanted to make that was going to be defined by the hype. I think it’s a record that I made with the intention that people will take time with it and grow with it and only with time will people will have the sort of context for it. It’s a very different record. It doesn’t sound like the current trends, and I think that makes a lot of listeners uncomfortable at first. There’s something very confrontational about how stark the record is, and I don’t know that everyone knew how to take that. But it was just where I was at creatively, and I feel really thankful that the people that are connecting with it. I’m thankful that the listeners are letting me be honest and letting me feel heard in a world where people aren’t listening to one another. If you look on the stresses of society it’s just a lot of bad communication and people not having an open mind and open heart towards each other. So the fact that the record has been so embraced by people is a really special thing. It’s humbling and humanizing and again, just so inspiring. The amount of kids that come to me with stories about how songs affected them, and these are kids that have been dealing with depression. In some cases, kids that are suicidal. And for someone like me that has dealt with depression, it is very touching that I can contribute something to a person’s walk with that. That’s huge. And it’s moving in a way that only people who have lived with that struggle could understand. The acoustic guitar continues to dominate the music in the album. Do you think you may do a more electric release eventually? I’m going to make work that challenges me at the time. So it’s almost a guarantee that you’ll hear a very different sounding follow up full length. I’m interested in collaboration and where those partnerships will kind of guide my work, because I very much respond to the place and the people that I’m making work with. So you can anticipate yet again another sonically challenging record. You've always been a pretty prolific artist, putting out music as often as you can. Obviously you just released a new album and you're focusing on promoting that at the moment, but have you started getting any ideas for new material yet? Yes. I have new material. That’s all I can say about it. You set up your record preorder so that portions of the proceeds of orders go towards specific charities and causes. What made you decide to do this? I think the very beginning of how I came to punk is very much about the community aspect. That’s what really defined me. Here we are in Baltimore, not very far from DC, and a lot of what the Dischord artists and the way that they were leaders in their community really influenced me. Music movements and community engagement that you can see across the country and across the globe really informed how I did music as a kid. Running a non profit and throwing shows there and doing food drives and political discussions and movie nights and creating a space for poetry and visual art along music was really important to me. Just creating opportunities for people to connect and appreciate their community has always been important to me. When I started doing music again, I really wanted to make sure that that community piece was very important to me and I needed to do something with the preorder that took the spotlight away from the pressing info, how many of each color and the collectability or whatever because I don’t want people to be concerned with that. I want people to be concerned with how we can use our voice in creative ways to engage with one another. And just the fact that the preorder sparked so many discussions and made kids aware of our environment crisis. A humanitarian crisis such as child soldiers in Africa. Taking a look at things like hunger here in America and abroad. That was huge. To impact one life and to get one person involved with it would have been enough, and the fact that there are now more people engaged with these important issues is crazy. It’s so cool. It’s maybe the most rewarding part of putting out the record. I've been wanting to ask some artists that played this since I actually ended up going to it, but what did you think of the Meltdown festival you played earlier in the year? It was very cool for me. Let me think of a better word than cool. It was a full circle moment. I grew up seeing a lot of the artists that got to play, and there are a few songwriters that I shared the stage with that were very formative in encouraging me to continue. One of the first people that did music on a professional level to say “hey, you got a good voice” was Anthony Green. A little bit later down the line I played some shows with Kevin Devine and that’s when I thought “I think I want to do this.” That was before I did this full time, one of my first tours. And he’s just like “keep doing this.” Just last year I befriended Vinnie and again he is just a huge encouragement to me, so to play a show with those guys and to just share a stage with them was insane for a small town Pennsylvania kid. I’m from a scene that didn’t produce tons of bands that everyone knows about. I’m one of the last people from my area still playing music that I grew up with, so I feel very much like an outsider and an outlier, not due to the success and the strength of what was happening in Harrisburg. Oh wait, it was. It was because of my small town community that I pushed so hard. So the fact that I can represent them aside these huge names was just so special. Stuff like that, opportunities like that aren’t guaranteed for any of us. You need to work so hard for it. And some of it is about getting lucky. I just felt so incredibly fortunate to play that fest. It was great. After this tour, what are your plans for the upcoming months? Some things I can tell you about, some things I can. The thing I am most looking forward to is my UK and Europe tour with Into It. Over It and Slingshot Dakota. Both great friends of mine. That’s the big highlight of the last half of the year. I also have a mixed media photo based show that I’ll be doing in Harrisburg. That’ll be the first time sharing any of the photography and drawings that I’ve made over the last eight years, so I’m pretty excited. Any last words you have to say? I want to say thank you for your time. I want to thank the people that I’m on tour with. Have Mercy, Ivy League, and Turnover. And mostly I want to thank the people that support what this community has to offer. It’s so empowering, not for us as artists, but for the people that are able to come and see regular normal people. We didn’t come for money. We didn’t come from a crazy point of privilege. We’re just so honored to be able to be making music on our own terms and it’s great for kids to see that. That you can do this. We are the kids that we are playing for. You know what I mean? You can get out there and start a band, start a label, make shows or just continue supporting bands. You can do it to. So I want to thank people for their spirit and energy and how inspiring it is for a guy like me. I'd like to thank Koji again for spending time to speak with us. He is an absolutely fascinating figure in the music scene, using a different approach to music than most others out there have. Crooked In My Mind is a fantastic record that gives off a specific energy, one that isn't felt often these days. It's an honest, stripped down and in your face record that carries an emotional weight sure to be one of the strongest of the year. 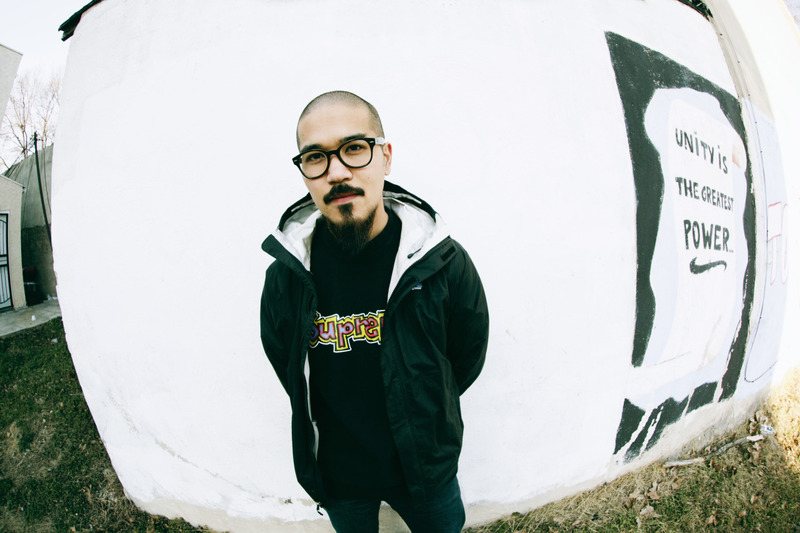 Be sure to check out the album on Bandcamp, and follow Koji on Facebook.